That inspirational travel quote is more than appropriate as I post this from the beautiful Hotel Julien in Dubuque Iowa overlooking the rapidly-rising Mississippi River. I have just finished up a week long conference with the directors of 71 Bank Travel Clubs, members of Heritage Clubs International, sharing ideas about fun trips they can present to their members. Of course, my job is to steer them across Nebraska and to North Platte, but my greatest take-away from this meeting is the conversations with new friends. These travel club directors are not only hard-working bankers and tour guides, but they change lives by helping their members broaden their horizons with travel. Thank goodness there are people out there like them to help people who may otherwise not have the courage or ingenuity to plan amazing trips. 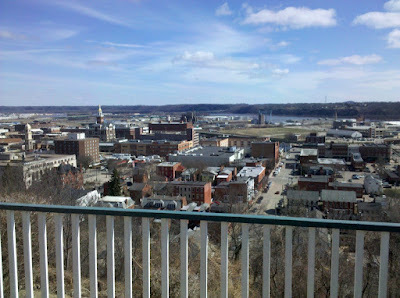 Dubuque is a beautiful city, even in the starkness of a late March cold snap. This is taken from a bluff overlooking the river at the top of a cog railroad (naturally, closed at this time of year.) The downtown and riverfront area have been revitalized recently and offer great attractions, dining and shopping. 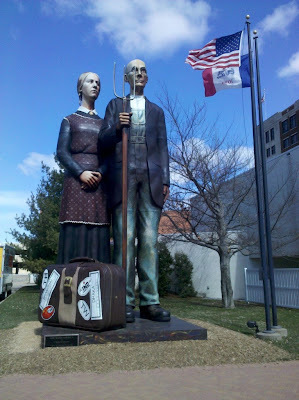 Art isn't forgotten in Dubuque either. This 30-foot tall sculpture graces the entrance of the city's art museum, and there are lots more little galleries and theatres. Of course I would find an Irish pub! The Busted Lift is right on the corner across the street from the Hotel Julien. It is reminiscent of The Dubliner in Omaha, except the original sandstone walls of its basement home are much more picturesque. If this pub was in my hometown, I would be a regular. 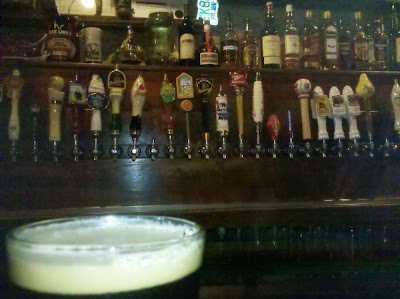 I counted 26 draft beer taps! Pub Trivia, traditional Irish session and regular live music round out the experience. One of the components of the revitalized Riverfront area is the National Mississippi River Museum and Aquarium. It is a wonderful attraction, sadly, we didn't have much time to explore. It would definitely be a "don't miss" if you make the trip. One of the landmarks of the city is the beautiful courthouse. I thought at first that it was "just" an historic site, but found out that it is also the actual courthouse. When you walk in you'll go through metal detectors (something we don't have to do in many parts of Nebraska), then you're free to roam the halls admiring the beautiful woodwork and architectural details. It was begun in 1890 and completed in 1893 and I'm absolutely amazed that it is still in use! The officers manning the metal detector can offer some advice about what not to miss. The last improvement made to the exterior was the application of gold leaf to the dome, which is quite a sight glowing in the rising or setting sun. Grammercy Park is on a bluff overlooking the Mississippi river in East Dubuque, which is actually in Illinois. Besides the great views, it is the home of 26 ancient burial mounds from the Hopewell culture. Very interesting. I didn't know I would get a chance to see mounds on this trip. 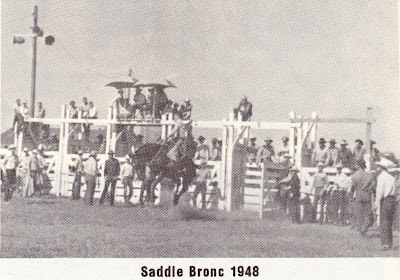 The park was constructed in the 1930's as a CCC project. 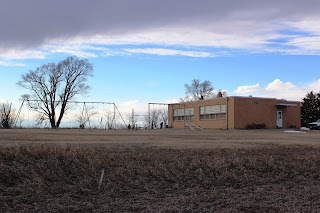 Though it is kind of hard to find, the views are worth it, and there are a lot of trails that wind through the property, complete with informational panels. Heading on into Galena, the first hint of the amazing architecture that's been preserved there is the Ryan Mansion. Thankfully it is now a Bed and Breakfast (there are 40-some in Galena! ), and is also open to tours (naturally, those begin April 1). The Galena/Joe Daviess County Visitor Center is the restored Chicago Northwestern depot, and is a sight in itself. I would say that Galena doesn't need a poor blogger like me to help tell its story, except for the fact that there is a squabble between the City of Galena and the county Convention and Visitors Bureau. They have now split, and you can tell there is just a tiny bit of animosity between the two. Don't let that stop you from visiting both visitor centers (the other one is in downtown Galena) because they both have great information. The beautiful historic downtown Galena area is protected by flood gates, which have had to be closed to protect the area. I wish it had been a prettier day and that my photos had turned out better. As it is, there is no way I can capture the spirit of this amazing city. From what I understand, after the boom of the lead mines in the middle part of the 19th century, the economy was such that there wasn't any money for "revitalization" (we all know that is a code word for destruction! ), so the great architecture remained intact until the late 20th Century and the beginning years of the 21st Century when it was appreciated as it is. It is a treasure not to be missed. Downtown Galena could well have an "underground" history all its own. We were told that the streets in the downtown area were so prone to becoming mush with a little bit of rain that the street was raised nearly a full story. The brickwork you see here is the top of the original first-floor windows. In another lucky break for the city of Galena, after the death of President Grant and his widow Julia, the children deeded his home and all of the furnishings to the state, with the stipulation that it remain a museum. It is beautiful and well-preserved. The summer kitchen houses rotating exhibits, which currently is presidential china and presidential pets. The statue of Julia overlooks downtown Galena and the Galena river. She was an incredible woman, well ahead of her time. Easily as interesting as President Grant himself. There is a wonderful historic cemetery just down the road from the Grant home. Well worth a visit to read the history in the carvings. This is a very poor representation of the great times we had in Dubuque/Galena. Unfortunately, the nature of this conference is that it must be held in an off-season, and that it give the bank travel leaders a taste of what can be seen in the area, in the hopes that they will bring tour groups back. We "partners" are fortunate enough to get to travel along, but none of us get to spend too much time anywhere. 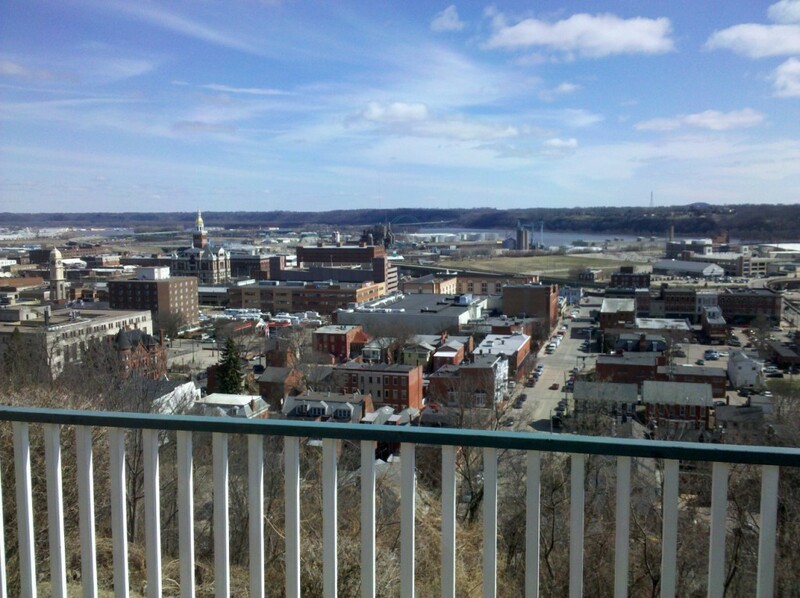 The area is filled with hike and bike trails, you can canoe and kayak the Galena river, golf courses abound, shopping is wonderful in both downtown Galena and Dubuque, historic tours and attractions are plentiful, there is gambling at two casinos adjacent to the Mississippi, where you can also tour the river via historic vessels. It really is an all-purpose destination. Thanks for sharing this brief visit. The coffee is always on.